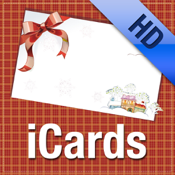 Here comes iCards HD Lite, a fashionable and beautiful greeting cards application! There are as many as 50 kinds of greeting cards styles, including Valentine’s Day cards, Christmas Day cards, birthday cards and so on. In this great app, we have collected lots of holiday greetings for you with our utmost care. With these festive and graceful sentences, you can send your best blessings to your friends and relatives.